A sunny football fiesta this afternoon down at the riverside and a good crowd in attendance. A Community kids showcase first, then County fans took on their Rothes opposite numbers. The fun culminated in a legends match between County and Rothes. 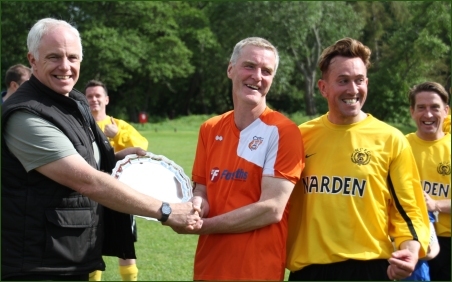 Afterwards Club Chairman Donald Matheson made a presentation to the Rothes captain. 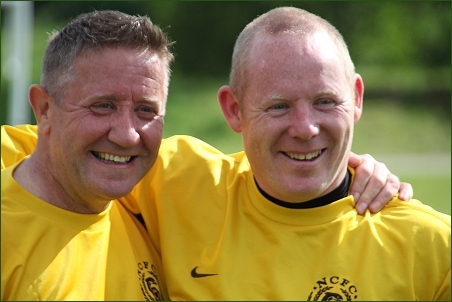 Playing in the Nairn Legends team was Hearts legend John Robertson. Here he is pictured with Nairn's Steven (Tessa) Sanderson who got at least six goals today we believe.